Today, H&M announced its next designer collaboration will be with Italian label Marni. Woop! Woop! It's going to be printastic! Sounds great, doesn't it? Well, you won't have to wait too long as the collection for men and women launches on 8 March 2012 in around 260 stores worldwide and online. And you can expect 'incredible craftsmanship behind every piece' says H&M's creative advisor Margareta van den Bosch (above centre) of the collection, which will include jewellery, shoes, bags and scarves. Isabel Marant fans rejoice, the French designer has collaborated with Gap to produced a limited-edition T-shirt and it launches tomorrow. Designed to mark World AIDS Day on 1st December, the tee for (GAP) RED costs £24.95, with 50% of profits from sales of the T-shirt going to the Global Fund to help eliminate AIDS in Africa. With her easy, understated style, Isabel Marant already makes the world a better place – even more so with this slouchy, boyish tee. Get yours now and its colourful, playful print will ensure you're new-season ready. See my previous blog posts about (GAP) RED products here and here. I've got some really exciting news to share with you: this month, I'm guest blogging on River Island's website as its industry insider! Now, River Island is a high-street store I hold dear to my heart as it's where I cut my fashion teeth as a Saturday girl. So you can picture my excitement when they asked me select a head-to-toe River Island outfit to blog about. The Stickman has done me proud with the photographs. Click here to see the full story and let me know what you think. If you're a fan of L'Oréal Paris Casting Crème Gloss, don't forget to enter its 'Cast Yourself' competition. You've got until Sunday 27th November 2011 to enter and you could win yourself a starring role next to Cheryl Cole! As I mentioned earlier this month, L'Oréal Paris is looking for three girls to appear in its next Casting Créme Gloss advert alongside spokesmodel Cheryl. 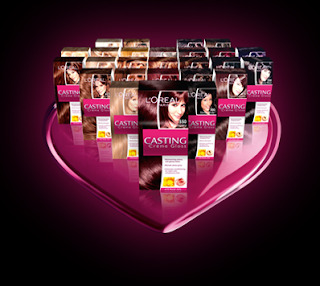 So, if you're a deep brunette, a fiery redhead or a honey blonde (all courtesy of Casting Crème Gloss, of course), hurry and visit the L'Oréal Paris UK Facebook page now. Simply click on the application button on the left-hand side of the page and follow the instructions to upload a picture of yourself. Then from 28th November to 4th December 2011, get friends and family to vote for your picture. The most popular brunettes, redheads and blondes will be shortlisted for a L'Oréal Paris casting day, where a panel of judges will choose the lucky winners. Need a reason to enter? Well, because you're worth it. Good luck! Disclaimer: Opens to female UK and ROI residents aged 16+. Entrants must register with L’Oréal Insider, colour their hair using Casting Crème Gloss and upload a photo on Facebook. No purchase necessary. Closing date 27/11/2011. For full Terms & Conditions and to enter visit this page. Remember I said that I know I'm onto a winner when someone compliments me on what I'm wearing? 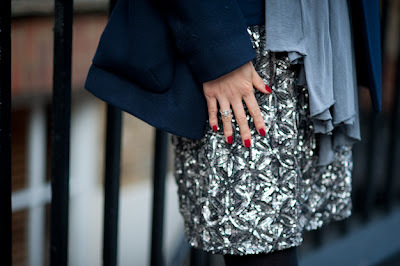 Well, another such purchase is this silver sequined skirt. I've worn it to work a few times now and everyone comments. Sure, it's hard to miss, being so glitzy. But what draws attention is the fact it looks high end when it's actually high street. New Look, if you will. I put it down to the flower-patterned formations of the sequins, which look heavy and intricate. Oh, and the fact that I bought a size up to get more length; less mini = more work-appropriate. Are sequins really suitable for work? Sure, sparkle works in the office so long as you're not dressed for going out. I wear mine with simple white T-shirts, navy/grey/black wool V-necks, thick black tights and ankle boots. 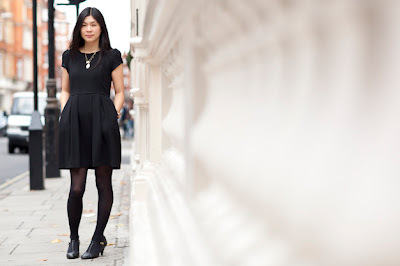 With party season coming up, the added bonus is that this is the perfect day-to-night skirt. So, if you're going out straight from work, a change of top and shoes and you're good to go. It goes without saying that you can buy this purely for going out. Plus, unlike glitzy party dresses, which can look a bit gaudy post-Christmas and New Year, it has more longevity, together with being a little bit more versatile. You can glam it up as much as you like or, equally, just dress it down. Get it now from New Look's Limited Edition collection. Even better, it's reduced from £59.99 to £44.99. 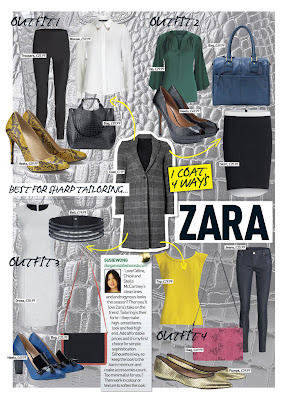 For more workwear ideas, see ELLEuk.com's What ELLE Wears blog. I know I'm onto a winner when someone compliments me on what I'm wearing and this dress is one of them. Zara has come up trumps with this classic LBD for just £39.99 as it looks more expensive than it is and is effortlessly easy to wear. The flattering shape features a high waistline, full skirt, exposed gold zip at the back and hidden side pockets and makes my working wardrobe a breeze. 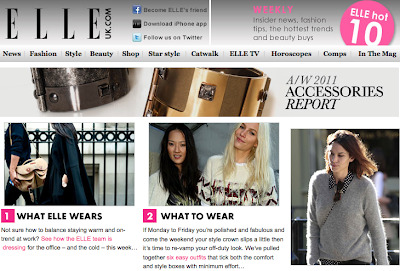 See ELLEuk.com's What ELLE Wears blog for more workwear inspiration. When ASOS asked me to pick my top 10 sale buys back in August, one of my choices was a charm ring by Bing Bang. I liked it so much, I put my money where my mouth was and bought it. 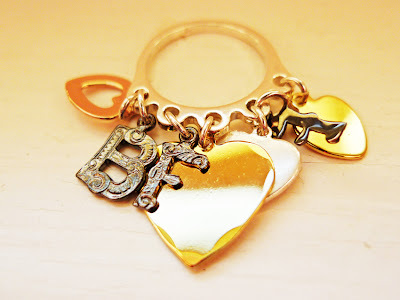 Since then, I occasionally check to see what other pieces of Bing Bang jewellery are available at ASOS, which was how I spotted this BFF sweetheart charm ring. Now, the attraction should be clear. Take the first two letters and you get Bargainista Fashionista's initials! It's as close to an off-the-shelf personalised ring as I'm going to get. Plus, I love the mix of coloured metals on this silver-plated ring from gunmetal to copper to silver to gold. The various heart motifs are pretty cool, too, with the largest feeling almost like a mini plectrum. Like my other Bing Bang ring, I love the movement of the charms against my fingers as they flutter with my every move. If it takes your fancy or you've got a BFF you'd like to give it to, it's in the sale reduced from £69 to £27. And don't forget the extra 10% off until 11.59pm tonight with the promo code BONUSTEN. I'm not sure if it works on sale items, but it's worth a try. Oh, and if anyone fancies buying this for Bargainista Fashionista, feel free! I bought it previously, but sheepishly returned it when my credit-card bill arrived (following my shopping spree of my top 10 ASOS sale buys!). Look! Me and my cape were number one in the ELLE hot 10 email the other week (thanks, Em, for spotting it). Yep, look at me, on the same page as Alexa Chung. Who'd have thought it! 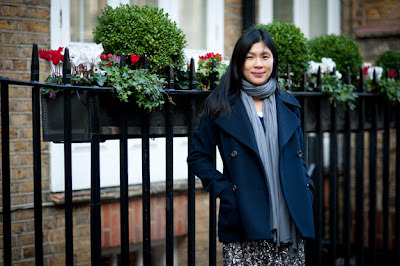 I love that the picture was an impromptu shot, taken by photographer Stephanie Sian Smith as I was walking back to the office. It shows the cape in motion and the lovely silhouette it creates. I'm so glad the cape trend shows no sign of waning as it's by far my favourite item of outerwear. The cape is by 2nd Day. Click here to see my previous blog post about it. 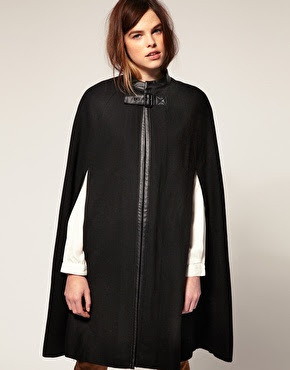 ASOS does a similar leather-trimmed cape (below). Available in black, golden honey and grey, it's £148. But, if you're quick, you can get an extra 10% off until 11.59pm tonight with the promo code BONUSTEN (and 20% off if you're buying partywear). Happy shopping! The X Factor isn't quite the same without Cheryle Cole this year. It wasn't just her wardrobe that had me tuning in, she did good hair, too. L'Oréal Paris is looking for three girls to star in the next Casting Créme Gloss advert alongside its spokesmodel Cheryl Cole. So, if you want to follow the likes of Cheryl and Jennifer Aniston and utter those famous words, 'Because you're worth it', and you're a fan of Casting Crème Gloss, you can cast yourself in the role of deep brunette, fiery redhead or honey blonde. To enter, visit the L'Oréal Paris UK Facebook page, click on the application button on the left-hand side of the page and follow the instructions to upload a picture of yourself. Entries are valid from 31st October to 27th November 2011. Then campaign for votes! Get everyone you know (and don't know!) 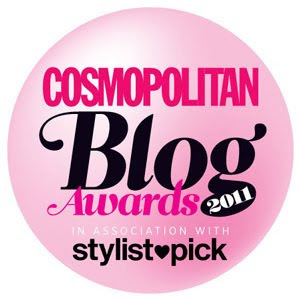 to vote for your picture from 28th November to 4th December 2011. The most popular brunettes, redheads and blondes will be shortlisted for a L'Oréal Paris casting day. Think of it as The X Factor of hair if you will as you'll audition in front of a panel of judges. And then, of course, the winners will appear in an exclusive new L'Oréal Paris advert alongside our Chezza. Good luck!